catching design for their “about to be created” dental retainer. You may ask yourself why. Why is this really necessary? custom tshirts, custom minicoopers and a bevy of other products that allow the consumer to add their own personal touch to the product that they’re getting. 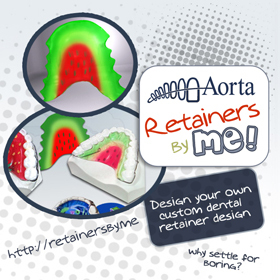 Dental retainers are a product, that although functional, can benefit from personalization. and kids this type of connection is invaluable when it comes to compliance. hiding away and trying to minimize it’s sheer existence. here that combines fun, design, and dental retainers.